Even better than the flexfields user guide.. Thanks a lot. Do you have any other subjects, you’d like to read about? Your article was very useful to understand the concepts of Special validation set. I have implemented the special validation set functionality. In the Invoice lines I have included a field in the DFF which calls the accounting flexfields DFF(special validation set). 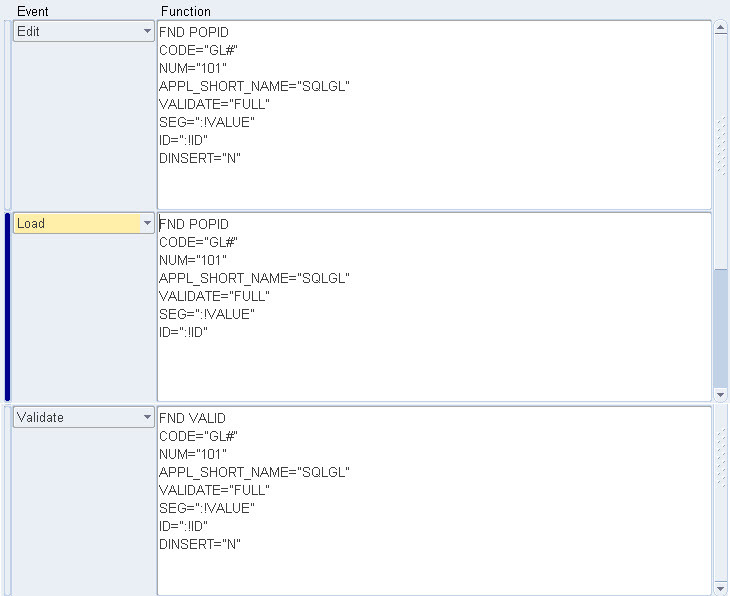 When I save the transaction it stores the code combination id in the lines attribute column which is okay. But somehow it updates/overwrites the distribution line account also. I don't want this to happen. Excellent your post was very helpful !! Thanks a lot !!! First of all thanks for this wounderful post. unfortunately your post was misplaced by the spamfilter. So the reply is a bit delayed. I have to test if it is possible. The best option would be to add a (hidden) 13th parameter. 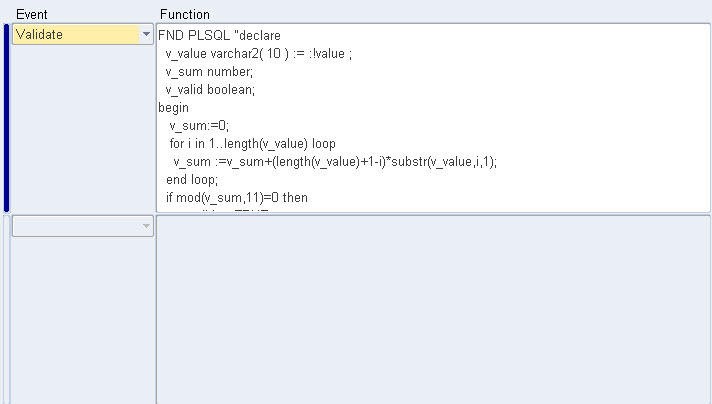 This could use a special validation calling a pl/sql block. Or it could be defaulted with the concatenation of the first 12 parameters. Hi, Thanks for the wonderful insight into the special and pair validation. But when I compile the flexfield I get the following error. Please check the WHERE clauses of your table validated value sets. Can you let me know what is the error due to or where am I going wrong. Any other suggestion to accomplish it. Hi, Thank you very much for the information. It's really useful. I've a requirement below described. Is it possible to use special validation functionality. 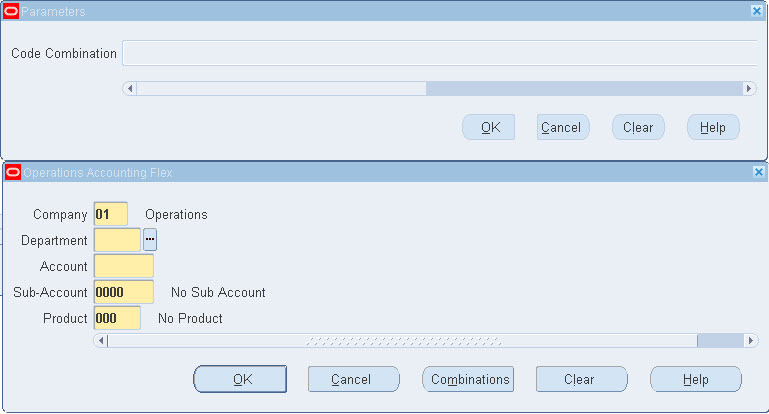 if check number 2 parameter is not null then the schedule number2 parameter must required to enter user. 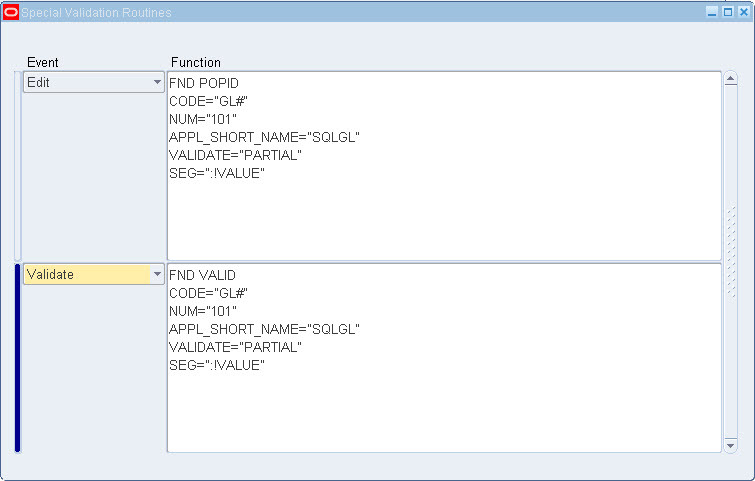 for that you do not need special or pair validation. You can use the regular Standard Date or Standard Datetime value set. 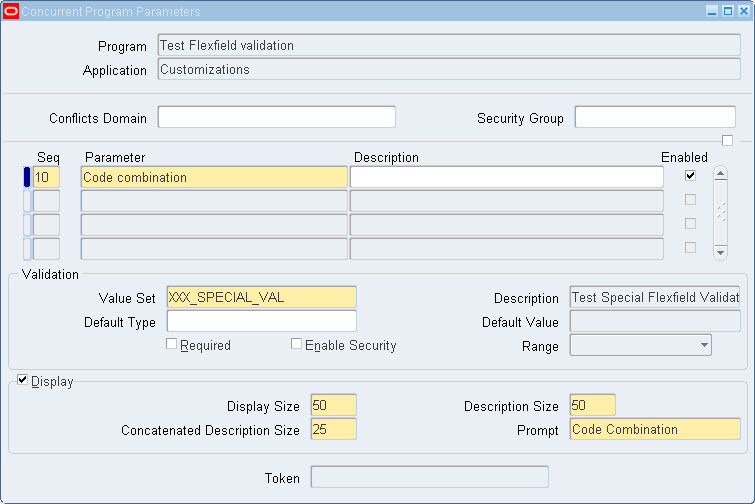 Then on the parameter form, enter the ‘Range’ field. For the from_date choose ‘Low’. For the to_date choose ‘High’. 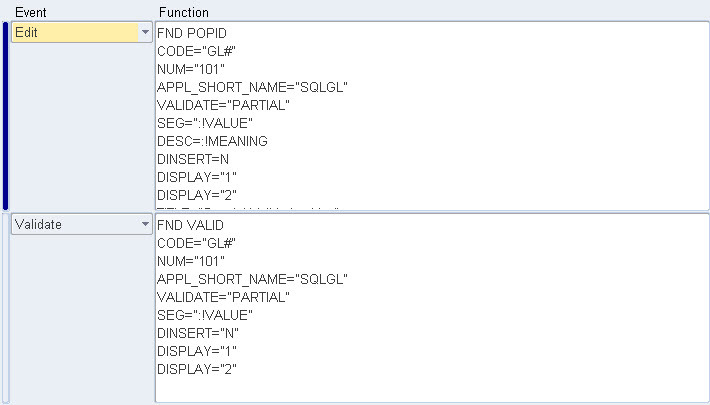 Oracle requires you to have 2 segments with the same value set that make ‘Low’ and ‘High’. Yes i agree but the error message displayed is Oracle defined, but i want to use user defind error messaage..if we pass from_date less than to_date.. I don't really want to write a graphical user-exit on my own, but other than that, do you know how I could use Special value set to allow a Multi-Value chooser capability? 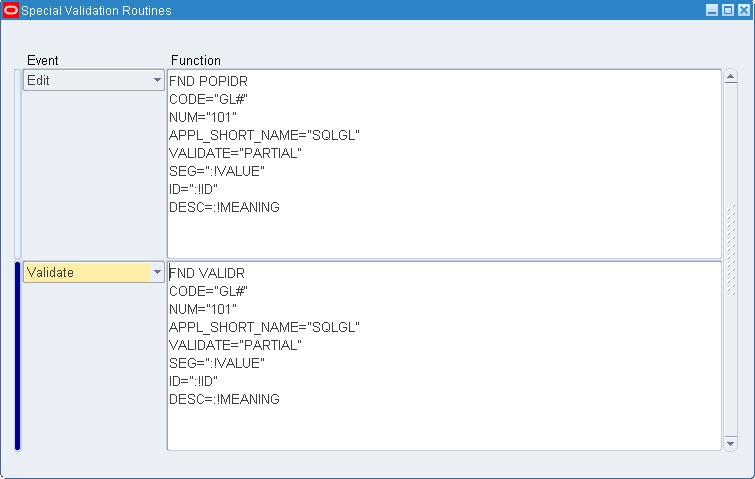 Think about the way Discoverer allows users to use a shuttle control to pick multiple values for a parameter at once, and it builds a string of parameters in quotes, that will be needed in a SQL "…IN ('','','')…" clause. We have a bunch of discoverer reports but we want to go away from them to BI Publisher reports in EBS. But our users really like (and use) this multi-choice capability for their reporting. Thanks for the valuable suggestions. Can anybody please provide example of Special value set using Date parameter. suppse I have two parameter. From Date and to_date. 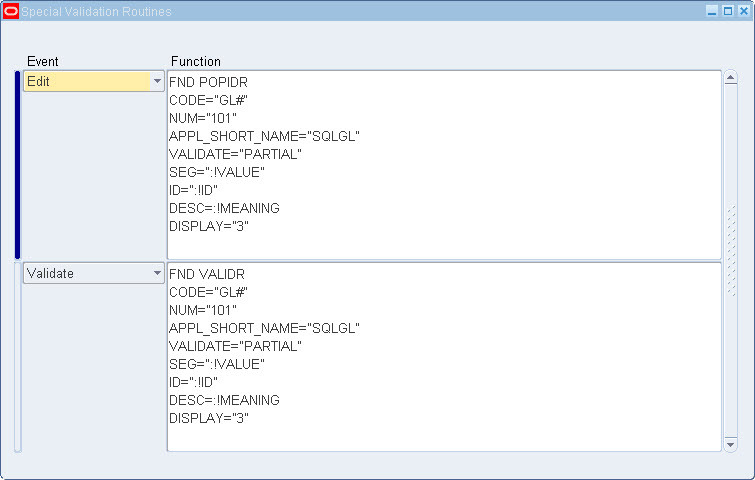 Bothe the parameter is having FND_STANDARD_DATE as value set. I want to incorporate one more parameter which will capture the TO_DATE as input and Add +1 to it like :TO_DATE +1, and it will paas to the report as new to_date parameter. 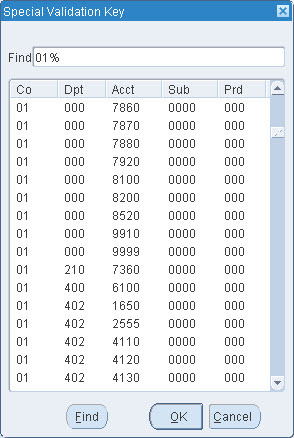 I am using a PAIR type of value set for my program and it is working. But, I have one more requirement here. 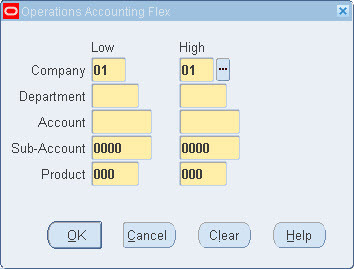 Out of the flex fields it displays, I want the first one to be mandatory (required) and the remaining as optional. Kindly let me know how can I achieve this. In the last screen shot of the above article, all the 5 segments i.e., Company, Department, Account, Sub-Account and Product as mandatory. But, is there any way that I can make only the ‘Company’ segment (The First segment) as mandatory and remaining 4 as optional. This is the user wanted from us. Kindly let us know if there is any way to accomplish this.